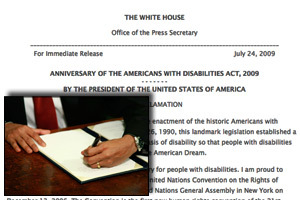 President Obama signed a measure last week recognizing the rights of people with disabilities around the world. The United Nations Convention Proclamation on the Rights of People with Disabilities calls for equality in access to public services, medical care and other services. It also called for the right for people to choose where they live: "To recognize the equal right of all persons with disabilities to live in the community, with choices equal to others." Yet in the United States, many people with disabilities do not have that choice. We reported in June that thousands of people nationwide want to live on their own, but instead remain in nursing homes, rehabilitation centers or state hospitals, often at a higher cost to taxpayers because of a historic bias toward institutional care. In 1999, the U.S. Supreme Court ruled that funding services for Medicaid recipients who live in institutions — and not those who live in the community — violated the Americans with Disabilities Act. "Signing a U.N. Convention proclamation doesn’t give anybody freedom," said Bruce Darling, a disability activist with ADAPT from Rochester. "We are still forcing people to live in nursing homes." Disability groups have pushed for legislation, such as the proposed Community Choice Act, which would allow people with disabilities to stay at home. Medicaid guarantees service in a nursing home for those who need that level of care, but similar services in the community are optional. Measures have been introduced in Congress for several years that would allow people to choose where they want services. When President Obama was in the Senate, he co-sponsored such legislation. But since he has been in the White House, Obama has not said he will support moves to make community services mandatory. In June, Obama called for increased spending on independent living services and directed HUD to provide vouchers to individuals trying to move out of institutions. A White House spokesman told ProPublica "the President believes that investing in health and long-term services for people with disabilities is an important national priority," but would not say whether the President will support legislation to make community services mandatory. "Ultimately this becomes a bureaucratic conversation about spending health care dollars," activist Darling said. "And we completely lose the concept that this is a civil rights issue for Americans. No other group gets locked up like this. No one would stand for it."